The new BMW 5 Series has been announced as the Car of the Year for 2017 at the 40th annual What Car? Awards, held in London. The 5 Series fended off stiff competition from Mercedes-Benz and Rolls-Royce to win the Luxury Car of the Year Award, before its blend of talents resulted in it beating all the other category winners to be named the best new car of the past 12 months. The latest 5 Series is even more efficient than its predecessor and sets the class standard for handling and refinement, while its interior provides technology and a sense of luxury usually reserved for far more expensive machinery. BMW Brand senior vice-president Hildegard Wortmann collected the Car of the Year Award following a significant 12 months for the Haymarket automotive portfolio. Wortmann commented: “For the BMW 5 Series to win the prestigious ‘Car of the Year’ award is an honour and testament to the hard work that goes into producing one of BMW’s core models. What Car? editor, Steve Huntingford, said: “The BMW 5 Series is no stranger to success at the What Car? Awards; it’s something of a dynasty that has always stood for excellence, but the latest model moves things on again in all the areas that matter most to buyers. 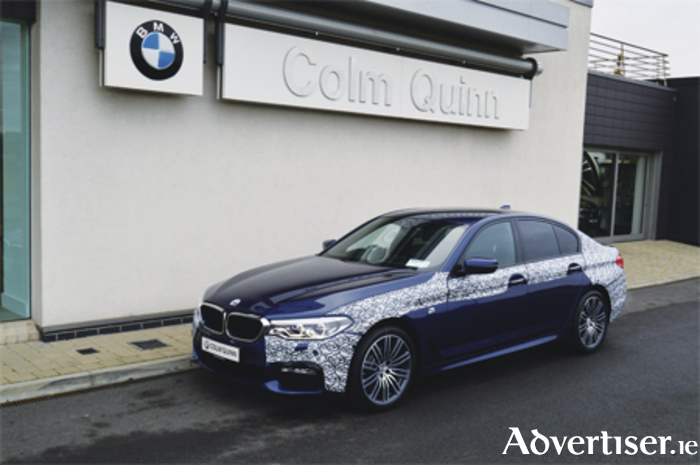 Colm Quinn - ‘Your home for BMW’ - can be contacted on (090 ) 6465888 or see www.colmquinnbmw.ie for more details.